Still riding on the success of Bajrangi Baijan, Kabir Khan has now come out with Phantom, a movie that takes a completely opposing view of Indo-Pak relationship. The movie, starring Saif Ali Khan, Zeeshan Ayub Khan and Katrina Kaif in the lead roles is scripted on the concept of seeking justice for the 26/11 Mumbai attacks. The script of the movie follows the storyline of the book named Mumbai Avengers by Hussain Zaidi and the interesting thriller has been released in theaters on 28th Aug 2015. The prologue sets the tone of the movie with a narration and display of video footage of the 26/11 attacks in 2008. The scene then shifts to present day Mumbai, where a group of intelligence officers are disgruntled by the Center’s ability to bring the perpetrators of the attacks to justice. As such they hire the court-martialed army officer Daniyal Khan (Saif Ali Khan), who is living an anonymous life, to avenge the massacre. The group sends Daniyal overseas to find the four masterminds behind the attack and even silently granting him permission to kill them accidentally. Assisting the shamed Daniyal in his new mission is Nawaz Mistry played by Katrina, an intelligence officer based in London who is assigned to special missions. The audiences are made to go through a shocking turn of events, gripping action scenes and more as Daniyal journey’s across different countries to accomplish his objective. Director Kabir Khan deserves all the praise for coming up with such a brilliant concept especially after his recent movie was based on developing a more co-ordial relationship with our not so friendly neighbor. While Saif Ali Khan and Zeeshan Ayub have performed their roles with much conviction, the same cannot be said about Katirine, fails to match the intensity that her character requires. What makes the movie truly stand out is the manner in which it reflects the actual feelings of most Indians about the manner in which the massacre of 26/11 should be avenged. The climax gives a proud-India feel to the audiences and also makes the movie worth every single cost in ticket money! Overall, the movie is a good watch as it talks about the serious issue of global terrorism with special focus on India. 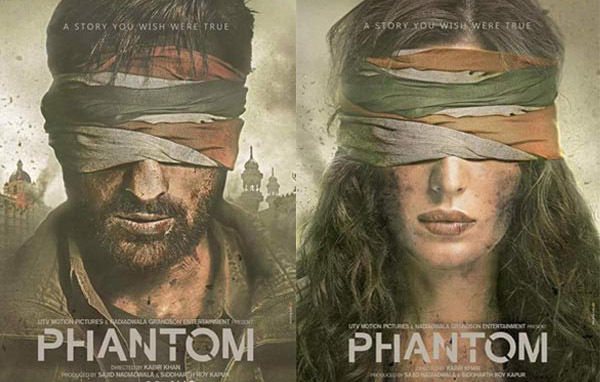 We at IndiaCafe24 give Phantom a rating of 3.5 stars.